Offering views of Al-Masjid Al-Haram mosque, this high-end hotel in a contemporary tower is 6 km from the Al-Safa Royal Palace and 7 km from Kaaba mosque.Offering floor-to-ceiling windows, modern rooms feature free Wi-Fi, flat-screen TVs, iPod docks and coffeemakers, plus prayer mats and rainfall showers. 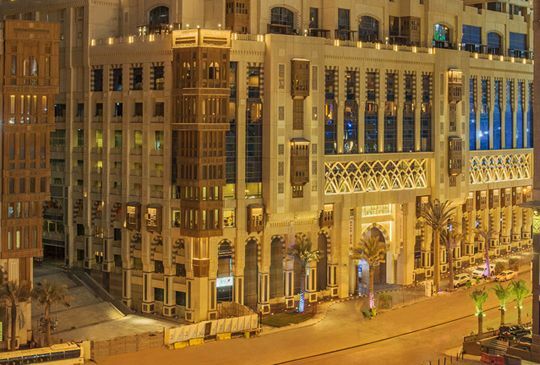 Upgraded rooms add partial Al-Masjid Al-Haram views, and suites add living rooms. Some quarters offer access to a private lounge. There’s 24-hour room service.Dining options include an international buffet, an Italian restaurant and a tea lounge, plus a convenience store. There are separate gyms for men and women, as well as valet parking. Set in a blue-and-silver tower, this modern hotel is 4 km from Al Reem Island, 3 km from the Qasr al-Hosn palace and fort, and 9 km from Marina Mall.The airy, contemporary studios come with kitchenettes and private bathrooms. They also offer Wi-Fi, flat-screen TVs and DVD players, plus tea and coffeemakers. Suites include dining and living areas.Amenities include a rooftop restaurant serving Mediterranean and Arabic fare, plus a French cafe. Event space and a heated outdoor pool are also available, along with a fitness centre, a sauna and a hot tub. Massages can be provided for a fee.